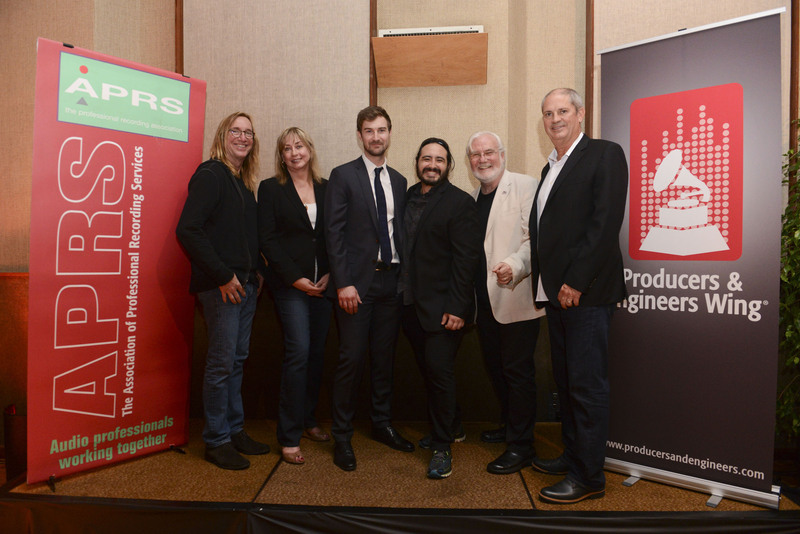 The Mix @ AES 2014 reception was hosted by UK-based Association of Professional Recording Services (APRS) and The Recording Academy® Producers & Engineers Wing® at United Recording on Friday, October 10, 2014. Pictured L-R: Producer/Engineer and P&E Wing Co-Chair Chuck Ainlay; Managing Director, P&E Wing Maureen Droney; Studio Manager, United Recording Rob Goodchild; Producer/Engineer BJ Ramone; Executive Director [Emeritus], APRS Peter Filleul; and Producer/Engineer and P&E Wing Co-Chair Mike Clink. Photo Courtesy of The Recording Academy®. Representatives from leading manufacturers, organizations and publications, along with members of the P&E Wing Advisory Council, at the P&E Wing Manufacturer Council Breakfast during the 137th AES Convention in Los Angeles. Photo Courtesy of The Recording Academy®/Clyne Media Inc. © 2014 Photographed by: Corey Walthall, Clyne Media, Inc.
Pictured L-R: Ed Cherney, Alex Da Kid, No I.D., Niko Bolas, Michael Brauer and Don Was, pictured at the GRAMMY SoundTables® event "Songs That Move The Needle" on Oct. 11 at AES137 in Los Angeles. Photo Courtesy of Maury Phillips/WireImage/The Recording Academy®. © 2014. Photographed by: Maury Phillips. SANTA MONICA, Calif. (October 30, 2014) — The Recording Academy® Producers & Engineers Wing® had a strong showing at the recent 137th AES Convention (Thursday, Oct. 9 through Sunday, Oct. 12, 2014, at the Los Angeles Convention Center), along with related events outside the convention campus. The P&E Wing's involvement spanned lectures, keynotes, a cocktail mixer and award presentation, and a manufacturer's event, among other activities. The keynote on Friday, Oct. 10 was presented by Neil Portnow, President/CEO The Recording Academy, The GRAMMY Foundation®, and MusiCares®. The GRAMMY SoundTables®, presented by the P&E Wing was held on Saturday, Oct. 11. This year's event, titled "Songs That Move The Needle," featured multi-talented production professionals Alex Da Kid, No I.D., Michael Brauer, Niko Bolas and Don Was, sharing their unique experiences in the art of music making. GRAMMY® Award-winning producer/engineer Ed Cherney acted as moderator. The panel's five multitalented, cross-genre hit makers debated the who, what, when, where and why of songs that have left an indelible imprint. The Mix @ AES 2014, a cocktail reception co-presented by the UK-based Association of Professional Recording Services (APRS) and the P&E Wing, on Friday, Oct. 10, at United Recording (formerly known as Ocean Way Recording Studios). Sponsors included AKG®, dbx®, JBL Professional®, Lexicon®, Focusrite Novation, GC Pro, iZotope, Record Plant and cocktails courtesy of VEEV Spirits. In a special ceremony, BJ Ramone accepted the APRS Sound Fellowship on behalf of his father, the late, legendary producer/engineer Phil Ramone. The presentation was made by Phil Dudderidge (Focusrite) and the citation was given by Peter Filleul (APRS). A Hi-Res Audio Production Workshop, co-sponsored by the P&E Wing along with DEG: The Digital Entertainment Group on Friday, Oct. 10.The event was moderated by GRAMMY®-winning engineer and director of music recording & scoring at Skywalker Sound Leslie Ann Jones, with panelists Chuck Ainlay (Dire Straits and Mark Knopfler, Taylor Swift, Miranda Lambert); producer and Chief Creative Officer of Concord Music Group John Burk; Bob Clearmountain (Bruce Springsteen, Rolling Stones, Bon Jovi) and Ryan Ulyate (Tom Petty & The Heartbreakers, Electric Light Orchestra, the Traveling Wilburys). These top professionals discussed the music creation process and shared their practices for recording, mixing and mastering in high resolution. High Resolution Audio—Super Session (Friday, Oct. 10), moderated by P&E Wing Managing Director Maureen Droney, and part of the Convention's High Resolution Audio (HRA) program. Panelists included Bruce Botnick (Music producer, recording and mastering engineer, VP Content Acquisition for Pono Music), George Massenburg (Producer/engineer/inventor, McGill University), Andrew Scheps (Producer/engineer/mixer) and Bill Schnee (Producer/engineer, Schnee Studio), who explored the most challenging issues facing the recording industry today concerning the adoption of high resolution audio. The P&E Wing Manufacturer Council Breakfast, held on Saturday, Oct. 11. At their biannual meeting, this group of industry leaders — who are dedicated to the advancement of sound quality and to the overall growth of the professional audio industry — shared ideas and discussed issues of interest to all parties in attendance, with the goal of raising awareness about the importance of high-quality audio, legislative wireless white space and broadband issues, music streaming bit rates and other related topics. The following manufacturers, organizations and publications participated: AKG®, Audio Engineering Society (AES), Audio-Technica, Auralex, Avid, DBX, Electronic Musician, Focusrite Novation, Fraunhofer, GC Pro, Genelec, Iron Mountain, iZotope, JBL®, Lexicon®, Manley, M-Audio, Merging Technologies, Mix Magazine/New Bay Media, Music Marketing/Melodyne, Music Producers Guild (MPG), Presonus, Prism Audio, Pro Sound News, Radial Engineering, Royer, Shure, Sonnox Ltd., Solid State Logic, Universal Music Group, Waves Audio and Westlake Pro. The P&E Wing ReCharge Lounge. Located in the Demo Room Concourse, the ReCharge Lounge was open to all AES badge-holders and featured charging stations for attendees' devices, bottled water and snacks, and comfortable seating away from the convention's crowded exhibit floor. Maureen Droney, Managing Director of the P&E Wing, stated, "We are always excited to participate in the annual Audio Engineering Society convention in the U.S. We have many of the same values as the AES – for instance, high-resolution audio and advocacy for producers and engineers – and it is wonderful to be given a forum to share our perspectives with the wider audio community at this yearly gathering." Photo Caption 1: The Mix @ AES 2014 reception was hosted by UK-based Association of Professional Recording Services (APRS) and The Recording Academy® Producers & Engineers Wing® at United Recording on Friday, October 10, 2014. Pictured L-R: Producer/Engineer and P&E Wing Co-Chair Chuck Ainlay; Managing Director, P&E Wing Maureen Droney; Studio Manager, United Recording Rob Goodchild; Producer/Engineer BJ Ramone; Executive Director [Emeritus], APRS Peter Filleul; and Producer/Engineer and P&E Wing Co-Chair Mike Clink. Photo Courtesy of The Recording Academy®. Photo Caption 2: Representatives from leading manufacturers, organizations and publications, along with members of the P&E Wing Advisory Council, at the P&E Wing Manufacturer Council Breakfast during the 137th AES Convention in Los Angeles. Photo Courtesy of The Recording Academy®/Clyne Media Inc. © 2014 Photographed by: Corey Walthall, Clyne Media, Inc.
Photo Caption 3: Pictured L-R: Ed Cherney, Alex Da Kid, No I.D., Niko Bolas, Michael Brauer and Don Was, pictured at the GRAMMY SoundTables® event "Songs That Move The Needle" on Oct. 11 at AES137 in Los Angeles. Photo Courtesy of Maury Phillips/WireImage/The Recording Academy®. © 2014. Photographed by: Maury Phillips.